I came bouncing through the door at about half seven last night. A much longer day than I’m used to but I’ve always maintained that good days don’t wear you out, not like bad days do anyway. Stacey had laid on a banquet of bread and butter, fried eggs, chips (healthy ones) and baked beans. Not just any baked beans, the ones in a spicy sauce. I asked if it was my birthday? Up early again today, easier this time and back on the 07:52 from Piccadilly to Buxton. It’s already feeling like a routine. I noticed the same lady who looks like someone from my old work stood on the other side of Hazel Grove station as my train passed through, and I winced for the second time in two days as excited school children screamed at each other on the train between the last few stops. These are the new characters in my new routine. They replace such characters as Purple Girl and Shouty Man. My only task this morning was to familiarise myself the online system. I sat at my desk, a beautiful teak thing straight out of the 70s which I love, and read various articles and PDFs about wildlife legislation and ID. As I did this I was booked in for three more bat surveys this month via a lady called Helen who I hadn’t met yet, by email. Scott and Ella amused us with stories of which teachers they did and didn’t like and we got back to the office in time to pack up and head home. 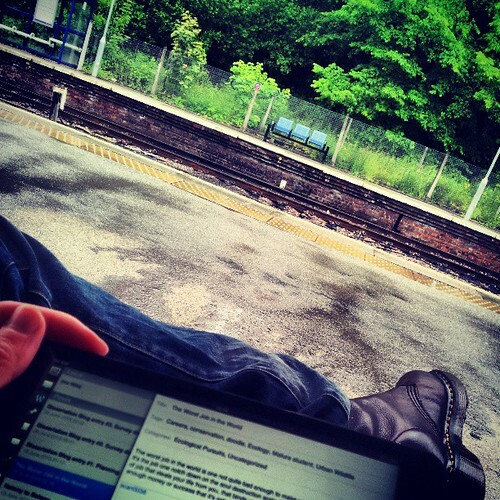 I sat on the station and wrote my blog facing a view I suppose I’ll be seeing a lot of for the next year.